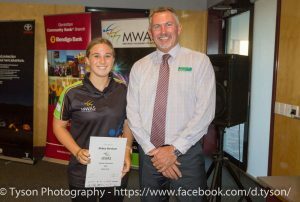 There must be something in the water at the Aquarena that has seen a great start to 2016 for MWAS Scholarship holders Abbey Benham and Ellie Pead, with both girls named in the WA Country Team selected at the end of the Country Week tournament in Karratha. The girls were part of a young Geraldton team narrowly defeated 14-13 by Bunbury in the final. The disappointment at losing was tempered somewhat by being named in the All Stars team. This selection comes hot on the heels of the pair making the School Sport WA Girls Water Polo team in January. The girls put the recent selections down to some good old fashioned hard work and quality coaching. 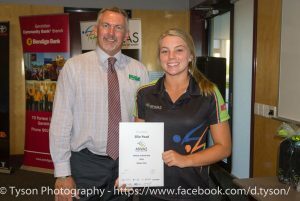 “Water Polo is a tough sport and the girls have done very well to make this team at such a young age“, commented coach and MWAS scholarship holder Ray Pead. Selection in the representative teams has meant a shorter than usual break post-season and the athletes are back in the pool as well as progressing their gym work with MWAS at Central West Health and Rehabilitation. We will follow their progress keenly at the next tournament in Canberra in May.